Canon today announces the expansion of its 4K camcorder LEGRIA range with two new models – the LEGRIA HF G50 and LEGRIA HF G60. The LEGRIA HF G50 has a 1/2.3-type sensor with manual control, coupled with premium optics and processing for superior image quality. The LEGRIA HF G60, with its 1.0-type sensor, provides advanced users with the ability to shoot vivid and stunning movies in 4K UHD. United Kingdom, Republic of Ireland, 2nd April 2019 – Canon Europe today announces the expansion of its 4K camcorder LEGRIA range with two new models – the LEGRIA HF G50 and LEGRIA HF G60. As an entry-point to the world of 4K, the LEGRIA HF G50 is designed to capture and future-proof special moments in higher resolution – boasting a 1/2.3-type sensor with manual control, coupled with premium optics and processing for superior image quality. The LEGRIA HF G60, with its 1.0-type sensor, provides advanced users with the ability to shoot vivid and stunning movies in 4K UHD. The latter – supporting Canon-developed Dual Pixel CMOS AF – is perfect for those looking to capture extra detail and dynamism. Both camcorders are integral to Canon’s growing range of 4K products, paramount for the market as consumption and demand becomes increasingly mainstream. With a new 4K sensor, the LEGRIA HF G50 captures outstanding levels of detail in 4K or Full HD with 4K oversampling – making this camcorder ideal for those looking to take their first steps into the world of 4K video, reliving their captured action in fantastic resolution. Allowing the user to push their creative ability, the LEGRIA HF G50 with its 20x wide-angle zoom lens and f/1.8 – f/2.8 maximum aperture, offers greater control over depth of field and excellent low-light capability, resulting in clearer and more vibrant content. Supporting Dual Pixel CMOS AF – Canon’s renowned sensor-based, phase detection Auto Focus (AF) technology – the LEGRIA HF G60 is aimed at enthusiast users looking to tell stories by capturing their passions, important family milestones and once-in-a-lifetime holidays in incredibly vivid 4K. Dual Pixel CMOS AF allows for smooth, high-performance focus tracking and fast autofocus acquisition, enabling users to create professional-looking pull-focus effects with ultimate simplicity – keeping a subject moving towards the user in sharp focus while maintaining a blurred background. With its large 1.0-type sensor and maximum f/2.8-4.5 lens aperture, the LEGRIA HF G60 also gives smooth control over depth of field and truly stunning image quality. Equipping users with a range of features that enhance their artistic shooting abilities, both camcorders feature circular apertures for smooth bokeh. In addition to this, the LEGRIA HF G50 and LEGRIA HF G60 both have powerful, wide angle optical zoom lenses, 20x and 15x respectively – enabling users to get close to the action with superior image quality. With customisable focus speeds, both camcorders can achieve almost instant smooth focusing enabling them to prioritise the look of a movie or the urgency of capturing ‘the shot’ for a documentary. Having the option to speed up or slow playback speed down, both camcorders allow the enthusiast users to get creative with motion and increase the dramatic effect of their video content. What’s more, both the LEGRIA HF G50 and LEGRIA HF G60 support Canon’s advanced Image Stabiliser (IS) technology. Shake-free, professional-looking content is maintained optically with high quality mechanical compensation for up-down/left-right camera movement, plus electronically with intelligent correction of roll and tilt. The customisable settings empower video enthusiasts to mould the LEGRIA HF G50 and LEGRIA HF G60 to their own shooting preferences; perfect for those committed to shooting in a specific style, whether it’s family moments or a personal passion project. With highly responsive and state-of-the-art controls, both handheld camcorders are compact and simple-to-use, ideal for capturing on the go. Both fitted with a professional grade zoom rocker, a dial to reduce menu diving, lens ring with fingertip light sensitivity and the ability to assign functions and commands to five buttons, the LEGRIA HF G50 and LEGRIA HF G60 make for an easy shooting experience. In addition to this, they both support adjustable exposure with built-in ND filters for wider apertures or slower shutter speeds. With both models featuring a highly responsive 3.0-inch (460,000 dots) capacitive touch screen and a 0.24-inch tilting high resolution electronic viewfinder, users can be confident the images are framed perfectly. The LEGRIA HF G50 and LEGRIA HF G60’s responsive touchscreen provides the ability to adjust tracking, focus and exposure, and their electronic viewfinder – excellent for shooting in tight and bright conditions to achieve a high-quality outcome. 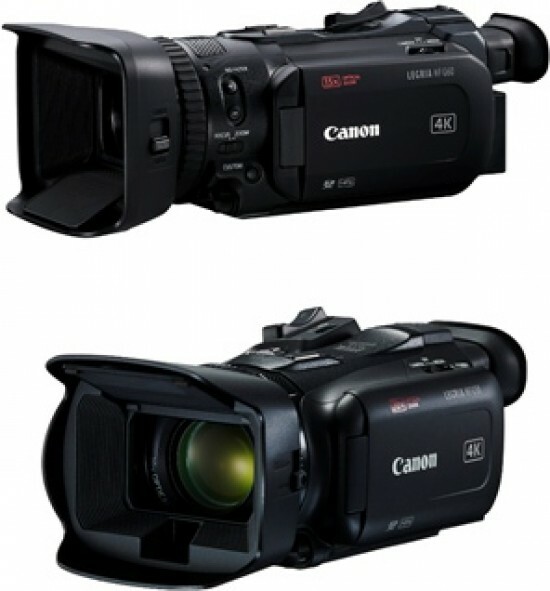 As well as this, both camcorders accommodate for dual recording with two SD card slots. Ideal for households already upgraded to a 4K television, both camcorders provide users with the ability to play their creations in stunning detail. With mini-HDMI connector, the LEGRIA HF G50 and LEGRIA HF G60 connect directly to 4K TVs making viewing footage fast and easy. Alongside today’s launch, Canon has also announced it is further bolstering its 4K product line-up with the launch of three new compact 4K UHD professional camcorders, the XA55, XA50 and XA40. For the first time globally, the LEGRIA HF G50 and LEGRIA HF G60 will be on display at NAB 2019 (8th – 11th April) on the Canon stand – Central Hall, C4425.